A unique Scottish Castle . . .
Fenton Tower is a magnificent, fortified; 16th Century tower located 18 miles East of Edinburgh near the coastal town of North Berwick. The castle’s location was originally chosen in the 11th Century because it afforded panoramic views in all directions and has had many distinguished visitors, among them being King James VI of Scotland (son of Mary Queen of Scots and Lord Darnley) who took refuge there as he fled from the rebel army in Fife across the Firth of Forth. The Tower has now been meticulously restored, and opened in 2002 to provide 5-star accommodation for up to 13 guests. 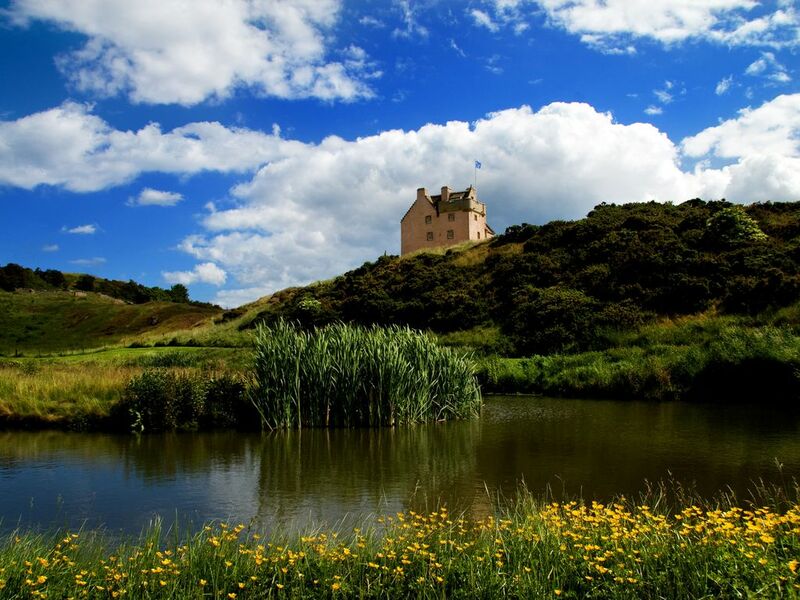 Set amongst rolling countryside and surrounded by many of the worlds’ most famous golf courses (Muirfield, Gullane & North Berwick) Fenton Tower is the perfect base for a magnificent golfing experience. The location of the Tower makes it ideal for all kinds of country, sporting and recreational activities. Arrangements for parties of up to eight guns for Grouse, Partridge and Pheasant shooting, as well as fly fishing on the rivers Tweed and Tyne can be arranged. With horse riding, archery, and 5-star local attractions (including The National Museum of Flight, home to Concorde, and the Scottish Seabird Centre) all within a stones-throw of the Castle, your visit to East Lothian will be one you will want to repeat. A visit to Fenton Tower, whether for one night, or one month, will never be forgotten. A warm Scottish welcome, simple luxury and comfortable surroundings await you, with our small, dedicated team there to guide, advise and facilitate your every requirement. You can treat our 20 acres of private land as your own as you daydream by our secluded loch, or just gaze out across the undulating East Lothian countryside. Your stay at Fenton Tower will be like no other. Our team will ensure that your itinerary is as full, or as relaxed as you would like . . . after all . . . this is your castle. Ian Simpson & John Macaskill are two friends who have known each other since school and who own the Tower jointly. Ian and his family live on a neighbouring farm whilst John lives in New York with his family. Ian's grandfather bought the farm that the ruined tower stood on in the late 1800's. Ian and John used to play in the ruin as children, and vowed that when they 'grew up' they would restore the castle to its former glory. Their vision was realised in 2002 when the house opened to the public after standing as a ruin for over 350 years. Their love for the old tower is evident as no expense was spared during the restoration. The house benefits from modern conveniences such as under floor heating and power showers that similar properties do not have, as well as a warm, welcoming family-run atmosphere. The fire in the Great Hall can be lit. The kitchen is available to guests for the purposes of making tea and coffee. A private chef can be booked to cater for your group. Please apply to the manager for more details. Sky TV in the library and free-view in all bedrooms. Recently back from an entire week at Fenton Tower. The Castle is magnificent. We had ten people and didn't even use one of the bedrooms. The staff was so kind, and the breakfasts were astonishingly good. The tower is a five minute drive from North Berwick, which has many nice restaurants and shops, and hourly train service to Edinburgh Waverly station. The train to Edinburgh is about 30 minutes, but it flies by. So you can very easily spend a half day in Edinburgh, and the rest of the day at the tower, or vice versa. We had a few catered dinners at the Tower which were off the charts. We also did archery one day, with participants aged 8 to almost 80 and everyone had a great time. We've been around, and rented some great places, but Fenton Tower is one of the very best. Honestly can't say enough good things. At the risk of soundly cheesy, the place is magical. There's also tons of golf courses around, it that's your scene. It was a pleasure to have you and your family to stay. I'm so glad that you enjoyed your time with us and hope that you took a great many memories back to Los Angeles with you. Alan and the Fenton Tower Team! I highly recommend Fenton Tower- my family and I just loved the accommodations and the surrounding peaceful countryside. The facilities are top notch, the staff great, and the location ideal- we loved exploring North Berwick which is an adorable seaside town about 10 minutes away. Fenton Tower is also quite easily reached from Edinburgh either by car or train (35-40 minutes). Ellen and her family were wonderful guests and we are flattered that you decided to end your Scottish holiday with a few nights at Fenton Tower. Best wishes from us all at Fenton Tower. Our two week visit in July couldn't have been better. We chose the self catered option which worked very well for our group of 11 people including kids. North Berwick is an awesome town with several pubs, shops and an excellent Tesco grocery store. We did a bird exploration boat tour, rode horses on the beach, a castle tour, the aviation museum, hiked Berwick Law, watched a local bagpipe parade (Wednesday evenings -highly recommend), clay pigeon shooting right in the "backyard" of Fenton Tower and drove to St. Andrews - although the roads closer to St Andrews got a little twisty for back seat passengers. Suggest a more northern route before heading due east into St Andrews. Manager Alan Thompson could not have been more helpful not only for setting up our visit, but also during our visit suggesting restaurants, pubs and things to do. The castle itself is extremely comfortable with excellent water pressure and very comfortable beds. There were sheep in the nearby pasture and the views were spectacular. Plenty of opportunities for short hikes around the fields immediately surrounding the castle and our 6-13 year old kids could roam the property unsupervised. We planned on doing a short day visit to Edinburgh, but am slightly embarrassed to say we never made it since we enjoyed the country atmosphere so much at Fenton Tower and North Berwick had everything we needed. Finally, we did our "big" family dinner (celebrating parents 50th wedding anniversary) at the Castle and was truly one of the best experiences of our lives! Not only was the meal incredibly delicious but the presentation/service at the table was superb. Only words of caution are there are a lot of steep stairs to climb getting to the bedrooms which could cause issues for some. However, there is a bedroom available near the dining room if needed. I highly recommend Fenton Tower for an unforgettable holiday! I'm so glad you enjoyed your stay with us and am very happy that your parents 50th anniversary celebration was a success. Enjoy the rest of your summer - From us all at Fenton tower. The week stay at Fenton Castle was phenomenal. I've stayed at hundreds of places all over the world, and the staff, the food, the accommodations were the absolute BEST I have ever seen. Every single detail was thought of to make our stay remarkable. The kitchen staff made meals that were cooked perfectly. Alan, the property manager, couldn't have done more to help us at the castle and travelling about. The rooms were clean, very comfortable and outright spectacular. If you're ever visiting Scotland, you must stay there and feel like a king! Thank you for such a kind review David. It was a pleasure to have you and your friends to stay for your Scottish golf trip. I hope we can welcome you back sometime. The facilities were great and the staff was extremely friendly and accommodating. Thank you for your very kind review. It was great to have you and your family to stay. I hope that all is well and that you are enjoying the rest of your time in Europe. Wonderful staff and castle. Amazing experience to stay in a castle. There are a lot of stairs, so if you are physically limited this would be a problem. But if you are up to climbing stairs, it's a very unique place to stay. It was a pleasure to have you all to stay, and thank you very much for your kind review. Standard / Off-Peak Rates - Based on 10 guests B&B. Additional guests (max 13) will be charged individually on top of the standard rate Christmas and New Year Rates - Based on 13 guests for a minimum of 3 nights B&B Dinner - £80.00 per person per night (minimum 8) Guests will be subject to Fenton Towers terms and conditions.